Our 2018 airplane fun came scattered in between our other travels. While we were on some of those other trips, we were always on the lookout for airplanes… antique and otherwise. To see any of these photos in a slide show with a larger size, just click on any of the photos. We got some fun photos of Cuban Classics for you. 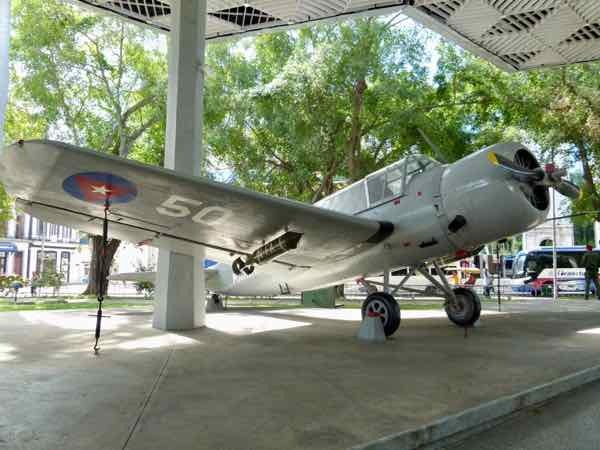 But in the Museum of the Revolution, we did find a couple of historic aircraft like this Vought OS2U Kingfisher. 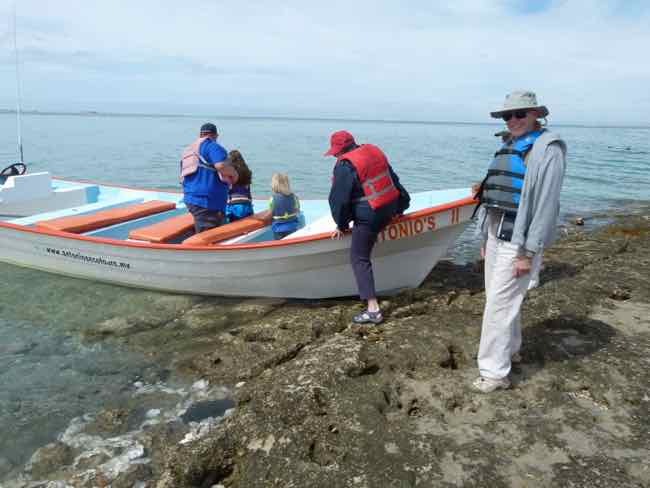 San Ignacio Lagoon is famous for their friendly whales… but getting there is an adventure. We didn't, but as we were driving out from the little town of San Ignacio (that's an hour drive all by itself!) we discovered a (sandy) dirt airstrip where you could fly in. There was a pilot on our boat who did just that with his grandkids. We can’t pretend to tell you how to do this… we can only tell you that it can be done! 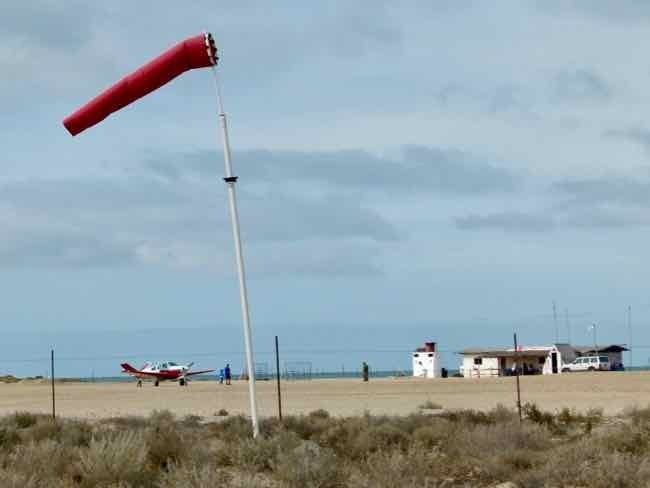 Wikipedia tells us that the airstrip is used solely for general aviation purposes, especially for whale watching tourism. If you’re brave enough… do some research! Flying in there would surely be an adventure! 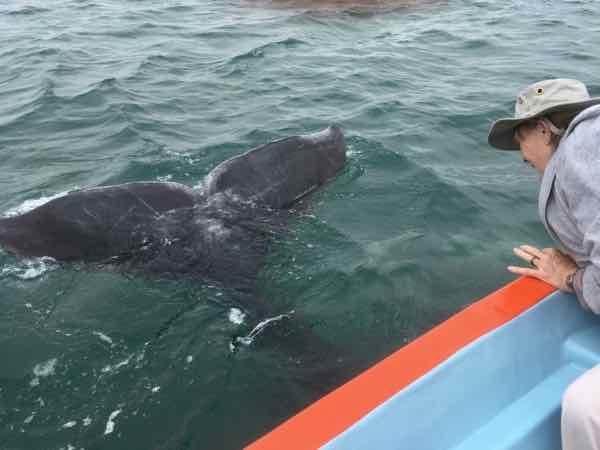 The whales are worth seeing…. They come right up to the boats… around and under. 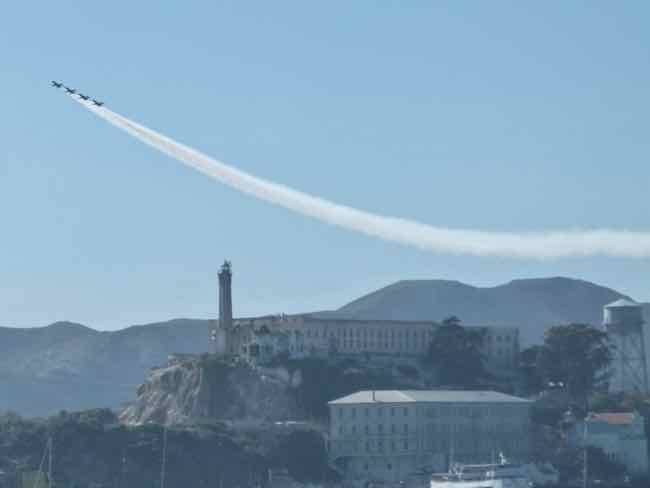 You can see them “flying” as they pass right under you. Do you remember Sky King and his Songbird? 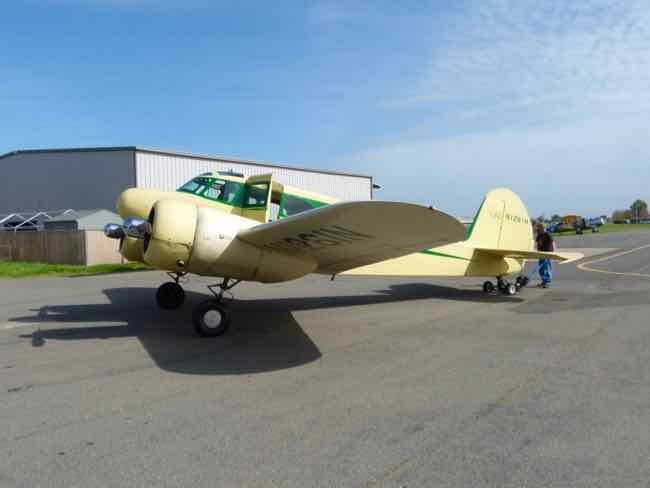 If you’re fond of antique airplanes, there’s a good chance you might remember this TV show from the 50s. Well, we found a Bamboo Bomber you can fly in. “From out of the clear blue of the western sky comes…. Sky King…!" There’s always something special at Oshkosh. This year there was a group there promoting an adventure that they are going to undertake for next year… in June 2019. 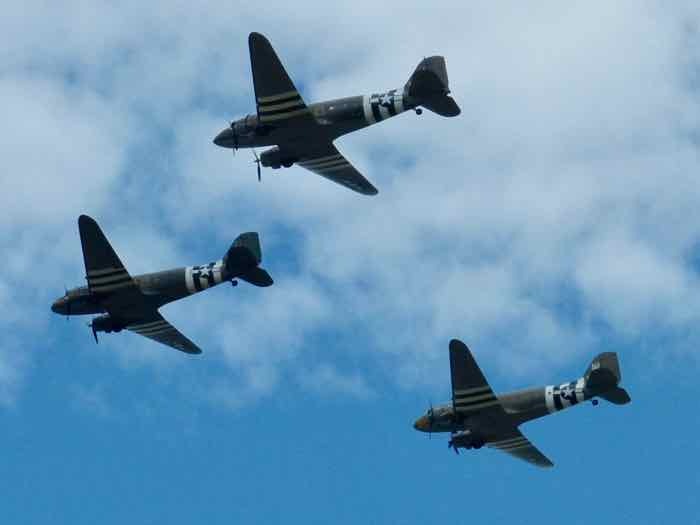 A group of pilots is going to take a group of C-47s from the US to England and France to commemorate the 75th Anniversary of D-Day. Read about how you can help the D-Day Squadron and even see this event. We were driving to visit friends in the Evergreen area of San Jose, California when we drove past this park. You might be forgiven for glancing at this sculpture, idly wondering about it, and then forgetting it. But this has everything to do with antique airplanes. John Joseph Montgomery was best know for his invention of controlled heavier-than-air flying machines. 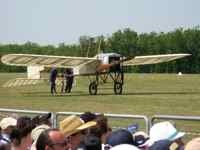 There is a lot of interesting aviation history there, but here we will just tell you that in 1911, a glider he was piloting encountered turbulence, stalled and crashed. He died near this hill. 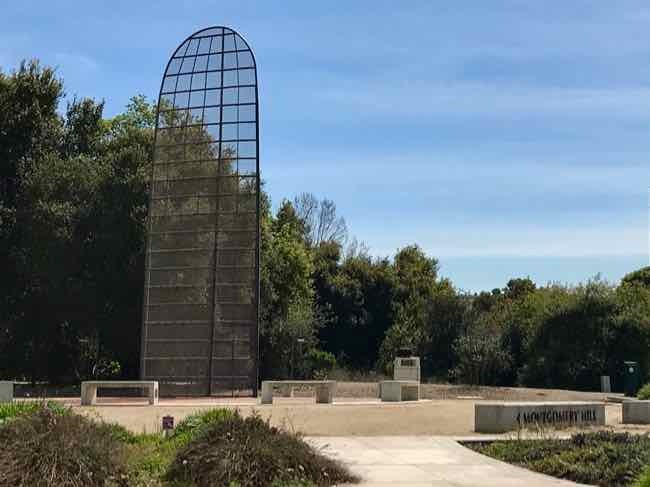 This 30-foot-tall steel structure of a glider wing was placed there as a memorial. 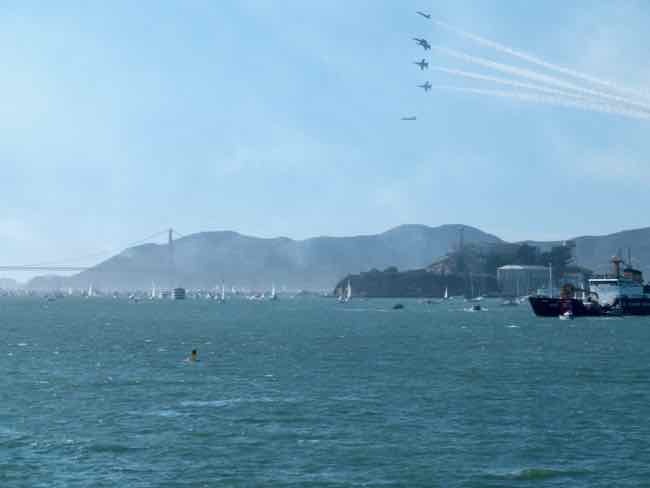 There’s nothing quite like being out on San Francisco Bay with the Blue Angels flying overhead during Fleet Week. 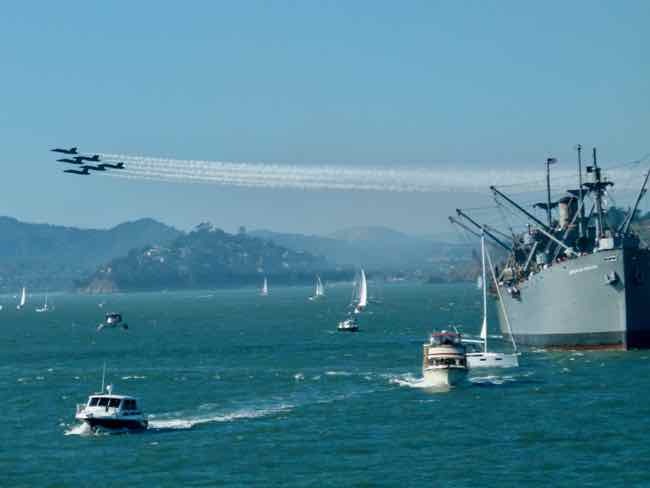 On the bay you may float along side the Liberty Ship SS Jeremiah O’Brien. Another historic ship that comes out is the Potomac which was the floating White House for FDR. 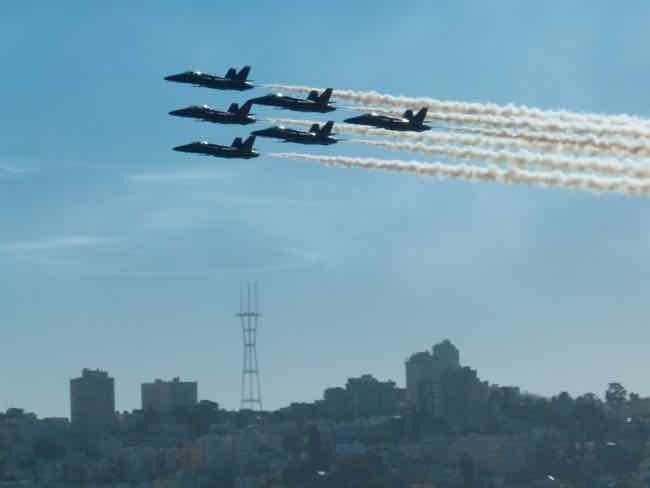 It does get a little hazy after 3 hours of air show participants flying with “smoke on”… so it gets harder to get good photos, but you get the idea. 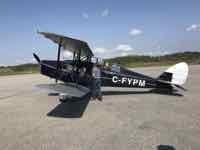 You can tell that some of our 2018 airplane fun was squeezed in with travels we describe over at MouseTours.com. If you'd like to tell us about some of your favorite airplanes or museums or 2018 airplane fun of your own, we'd love to hear your stories.